Love and Action Can Change lives! To Support Children with Leukemia! Oh yes! There’s nothing better than shaking a leg and enjoying good food for a good cause. 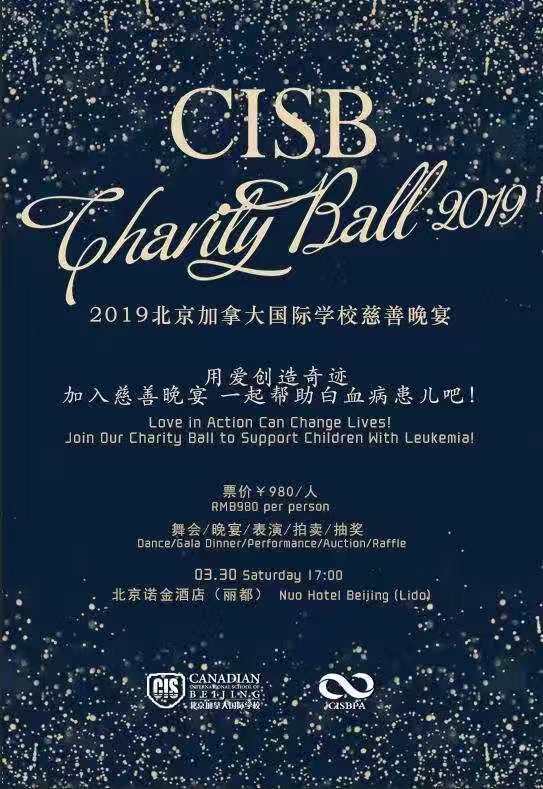 Parents, teachers, and friends are invited to join the Canadian International School of Beijing (CISB), for their second Charity Ball. Preparation is wrapping up for the event and thanks to the generous support of local families, facilitators have received many auction items, stage decorations, and offers of performances to make up what they believe will be an awesome evening. A few weeks back the school successfully organized and hosted an art auction consisting of 26 works of art donated by CISB students, which helped to raise RMB 17,850. The CISB Chorus also recorded a video for the Ball, and representatives of the school visited kids being treated for leukemia at the Capital Institute of Pediatrics Hospital (CIP). The event is in aid of offering even more support for these kids in need. Mark your calendars and show your commitment to the charity action on March 30. The goal is to raise RMB 600,000, all of which will be donated to the Angel program of China, Ai You Foundation. CISB believes that an action of love can change the lives of young kids suffering from leukemia, and welcome you to join this action by securing your seat(s) at the event as soon as possible. The afternoon’s event includes dinner at the famous Nuo Hotel, known for their culinary creations and fine dining outlets. A generous spread will be followed by a dance with Stevie Mac and the Mac Daddies! Get the purse or wallet out and reserve yourself a seat, get the glad rags on, and go and eat and dance for charity. Something tells me you won’t regret it. Scan the QR to register online! Can’t make this lovingly coordinated event? CISB will also be launching an online auction with some selected items offered by their sponsors and parents. Get spending and support kids in need. Adults. RMB 980. Mar 30. 5pm- late. Nuo Hotel Beijing, Lido.